Greenhouse gasses are a buzzword when it comes to climate change. But how do they work, and why do we call them greenhouse gasses? Let's watch the video below to find out more. 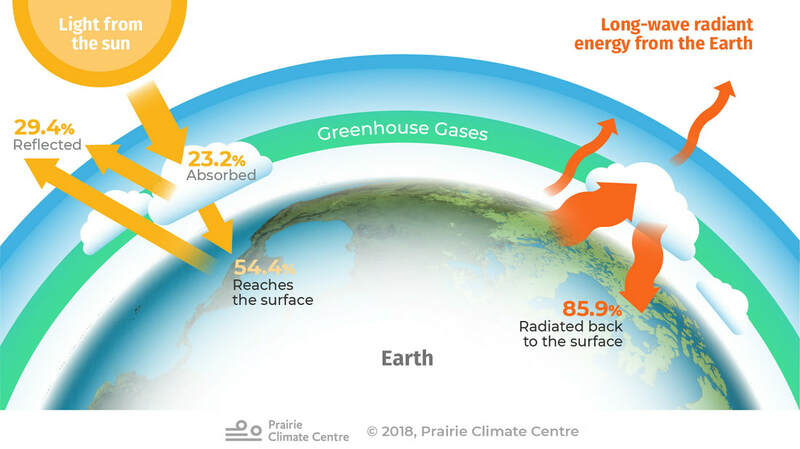 So, a greenhouse gas is a gas in the atmosphere that absorbs infrared radiation and emits it back towards the Earth instead of letting it pass through to space. Usually this is a good thing. This keeps us warm and makes life possible, but we have been releasing simply too much, and so the natural cycle of warming and cooling has been affected. Carbon Dioxide (CO2): The amount of carbon dioxide in the atmosphere has been rising dramatically since the industrial revolution. It is a product of burning fossil fuels. CO2 levels increase due to deforestation, since trees store carbon from the atmosphere (carbon sinks). Methane (CH3): Methane gas is a product of livestock farming. When forests are removed to make room for cattle farms this multiples the GHG problem. Methane is also releases by landfills, from rotten foods. Nitrous Oxide (N2O): Agriculture's overuse of fertilizer is the main reason for the increase in nitrous oxide. Fertilizers rich in nitrogene stimulate microbes on the soil to convert nitrogen into nitrous oxide at a faster rate than usual. N2O has a potential for global warming 310 times higher than that of carbon dioxide! Water Vapor (H2O): Water vapor is the most abundant greenhouse gas in the atmosphere. Water vapor enters the atmosphere mainly through evaporation but also through transpiration and volcanic activity. Ozone (O3): Ozone in the upper atmosphere is beneficial because it blocks harmful UV rays. However, in the lower atmosphere, it is a GHG. It is produced in a follow-up reaction when products of combustion are exposed to sunlight. Clorofluorocarbons (CFCs): CFCs from aerosol sprays and refrigerants not only are a GHG, they are also responsible for the hole in the ozone layer. CFCs have been banned in many countries, with over 200 countries agreeing to cease production by 2030. The ozone layer hole has started to close due to these changes in policy. The greenhouse effect is a natural process, and it is not all bad -- without the greenhouse feccect, Earth's average temperature would be only -18 C.